Bon, Only Death Is Real… (once again, I seem to have a déjà-vu???) was originally recorded in Spring 2000 at Fast Forward Studios (and then I am talking about Only Death Is Real… by Apocalyptic Raids, to avoid confusion; imaginary smiley again…) and initially released in 2001 via Brazil-based label Demise Records (this label did house tens of great bands at the end of last century and during the first half of last decade). It has been re-issued a couple of times before, and now Hells Headbangers, known for many other splendid re-releases (I am ‘into Hells Headbangers-worship…), do it once more; this time with more than one handful of bonus tracks, and in different vinyl editions. To start with: the cover picture. Inspired by Hellhammer or inspired by Hellhammer??? And then, the musical approach… Damn yes, this sounds so Eighties, with nothing but details that are not able to deny any inspiration by the Swiss Kult-band. The riffs and rhythm, the vocals (including the characterising ‘ugh’…), the tempo, the lyrical approach; even the (lo-fi) production seems to be influenced by the originators. It isn’t just a cheap copying-of-heroes that Apocalyptic Raids did back then, because that would be too easy. No, these Brazilians really try to create an own interpretation, yet without betraying their respect for these Swiss. A warning, however, be made. In case you are a worshipper of Hellhammer and (early) Celtic Frost, you will adore this material. Reason: many bands try to copy (or is it: to pay tribute to) but do not succeed at all; these Brazilians do succeed! But since this material is so comparable, and if you can’t get seduced by these tunes of morbidity, you will not get satisfied by this stuff either. The bonus tracks then. The second LP consists of eight epics. 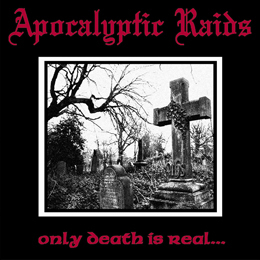 It concerns the tracks from Apocalyptic Raid’s 1999 rehearsal / demo, one track from the split-EP with Gravewürm (which was released as well under their moniker with a ‘c’, shortly before they traded that letter in favour of a ‘k’), and three new versions of older songs (two from the ‘c’-era, and one from the first official release done under the moniker that includes the ‘k’; are you still with me??? ).